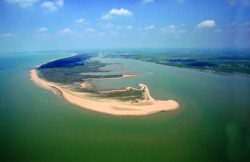 In the far south of the Vendée, with one of its finest beaches, is La Faute-sur-Mer. This seaside town which lies across the river Lay from l'Aiguillon-sur-Mer has some good restaurants and one of the largest mussel farms in France. The dunes behind the beach have been protected from erosion by the the 19th century planting of pine and evergreen oak trees. These forests now offer some great walks, and a fitness circuit for those who wish to keep in shape. The southern end of the Point d'Arcay is a protected nature reserve and annually thousands of migrating birds use it as a stop-over on their way South. The 10kms of beaches at La Faute-sur-mer are some of the finest in the Vendée and 4 of them have lifeguard stations during the summer season. There is an official nudist beach at the Point d’Arcay although there is no surveillance by life guards. With good shops, bars, restaurants, cafes and even a Casino, holiday makers are well catered for. There is a colourful market on Sunday mornings. To the North of the town is the nature reserve of Belle Henryette, this marshland behind the dunes was once the sea and as such was what used to make La Faute an island. Today it is home to many rare species of flora and fauna and is a migratory stop over for birds. An Irishman was shipwrecked, and it was this that gave birth to the legend that as he survived by hunting and fishing, and when using one of his fishing techniques which was to stretch netting between poles driven into the estuary mud. When doing this he noticed that mussels quickly attached themselves to the poles and hence started the practice of mussel farming on Bouchets, which is such an important industry for la Faute-sur-mer today. The huge mussel farms just off the coast and in the Anse de l'Aiguillon are, along with tourism, the town’s main industries, producing over 20% of the total mussels farmed in France. Market days: Thursdays and Sunday mornings, Place de la Mairie. Camp Sites; Camping Les Flots Bleus, Ave Chardons, Tel. 02 51 27 11 11. Camping du Grand R, route Tranche-sr-mer. Tel. 02 51 56 42 87. Camping Manicipal. Place Dr. Pascaud. Tel.02 51 97 06 16. Camping Pavillon Bleu. Chemin Ormeaux Tel. 02 51 27 15 01. Camping la Pinede. 100 route d'Arcay. Tel 02 51 56 40 62. Camping La Siesta, 237 route Tranche-sur-Mer. Tel 02 51 27 16 75. Camping Les Tulipes. Route Tranche-sur-Mer. Tel. 02 51 56 41 37. Camping les Violettes. Route Tranche-sur-Mer. Tel 02 51 27 19 97. La Petite Prise. Route Tranche-sur-Mer. Tel 02 51 27 87 44. Bike Hire; Locacycles, 3,Route la Tranche. Tel. 02 51 27 14 73. Bien eric. 33 rue Jacques Moreau. 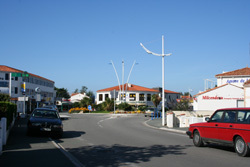 L'Aiguillon-sur-mer. Tel. 02 5156 49 01. Taxis; Taxis Cote de Lumiere. Rue des Marais. Tel. 02 51 27 13 33.